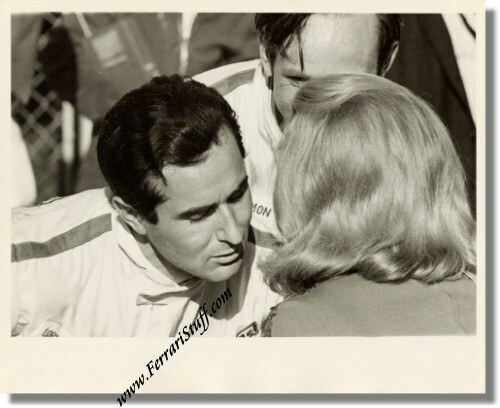 Vintage 1967 Photo of Lorenzo Bandini and Chris Amon being congratulated by Miss Firebird 1967, Edwina Winkie Louise at the Daytona 24 Hours 1967. This is a fantastic vintage 1967 photo Lorenzo Bandini (& Chris Amon) after having won the 1967 Daytona 24 Hours and both gentlemen look remarkably fresh after such an exhausting race. The duo won the race in their Ferrari 330 P3/4 S/N 0846 and Ferrari would score their illustrious 1-2-3 victory with all three cars crossing the finish line almost simultaneously. The photo measures some 25 x 20 cm or 10 x 8 inches including the white border as shown, is in near mint condition and carries no references towards the photographer on the back. Our thanks goes to David Hayes for identifying Edwina Winkie Louise in this photograph who would otherwise been known for ever as "the unknown blond woman". Thank you David!